The Voss Adventure: Swallow my pride. We didn't win. We weren't even close! It wasn't as crushing as I thought it would be. Actually, it was a great time with everyone from Matt's office. And there were at least eight kinds of chili to try. 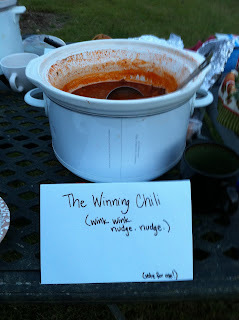 Note to self, for the next cookoff. DO NOT make 5 quarts of chili. We already had at least 3 quarts frozen. We added at least 3 more! Had it been a cutest baby contest, we would have one. Hands down.